The video has collected over 2.1 lakh views and some 12,000 reactions Facebook. A driver's heartwarming act of kindness for a complete stranger has touched a chord with many on social media. 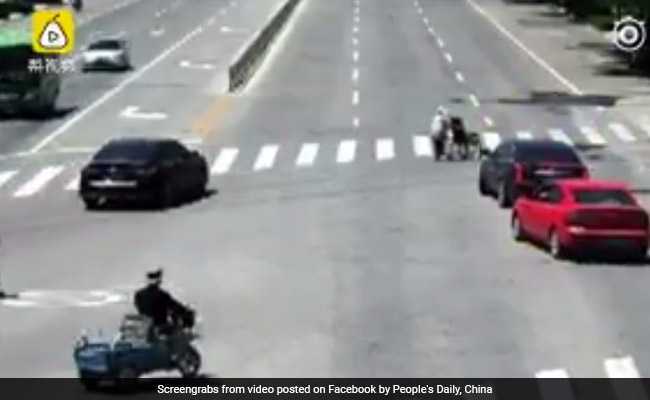 A video posted on the People's Daily, China Facebook page shows a driver helping out an elderly woman pushing a wheelchair across the road. Since being posted some 19 hours before writing this, the video has collected over 2.1 lakh views, some 12,000 reactions and more than 1,600 shares on the social networking site. According to CGTN, the video was recorded on a surveillance camera in Laizhou, China's Shandong province. It shows a woman pushing a wheelchair across a zebra crossing when the light turns green before she has made her way across the road. That's when a driver in a red car comes to her rescue. The video shows the driver blocking vehicles behind him so that the woman gets to cross the road safely. The driver only moves away from the woman when she is on the other side of the road. The video and the driver's selfless act has moved many on Facebook. "Everyone should to be like this kind heart one in China," says one Facebook user. "Would be a better world if we were all like him," says another.